Even though you may be busy getting ready for the holiday festivities, take some time to catch comet Catalina as it makes its way across the Northern hemisphere’s sky. If you’re up before the Sun grab your binoculars and look to the sky to see Comet Catalina (C/2013 US10) as it has brightened to 6th magnitude. The comet is making its way through eastern Virgo, and for the next week or so starting December 11th, 2015 Catalina’s dust and gas tails will be visible, although its surface will remain hidden behind a veil of dust surrounding the comet. Once Comet Catalina makes its way through Virgo, it’s journey continues setting its sights on Arcturus. Catalina then continues to climb northward for the next few weeks and will pass within 1° of Arcturus in early January. Chris Schur took this 30-minute exposure December 6 from Payson, Arizona, using a Stellarvue SV80S refactor with a Canon XTi camera at ISO800. We may be just now seeing this amazing celestial wonder, but this isn’t the first time Comet Catalina has made an appearance. Back in October of 2013 astronomers at the Catalina Sky Survey caught site of this beauty, but thought it was an asteroid (measuring in at 12 miles (20 kilometers) wide) on a very long orbit around the Sun. At this time the space-rock was given the provisional name 2013 US10 and was observed very closely on the nights to come. Astronomers realized it was indeed a comet! 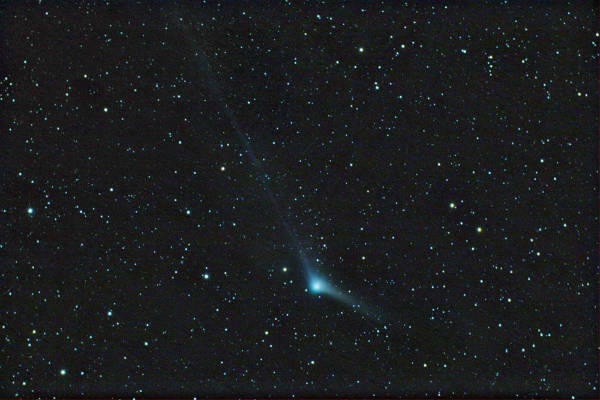 However, within six nights of careful observation, Don Yeomans and Paul Chodas (NASA’s Near-Earth Object Program Office, at the Jet Propulsion Laboratory) soon realized it was a comet, and re-designated it C/2013 US10 (Catalina). Interestingly, they also discovered it was not just any “ordinary” comet, but one that is on a million-year trek through the solar system. They also concluded that it was most likely booted out of the Oort cloud by some ancient encounter. Although, this will most likely be its one and only fly through our inner solar system Catalina’s closest approach to us won’t happen until January 17, 2016, where it will pass between the orbits of Earth and Venus (coming within approximately 67 million miles (108 million kilometers)). Name a star now! - Catch Comet Catalina In the Northern Hemisphere!